One of the reasons I love these pictures is because they’re both so adorable. 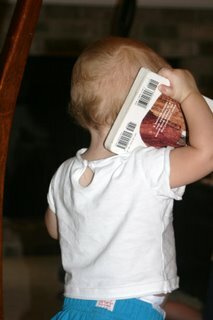 The other reason is because it makes me happy to see my 14 month old granddaughter becoming a bibliophile at such a young age. Not content to merely pore over the book’s contents, she also has to carry it around from room to room, perhaps to keep it from the hands of her older siblings or perhaps to find someone to read it to her. When Carrie, her sweet mama, sent me these pictures, I told her that Emma’s great grandparents AND her great-great grandparents would be proud. They were all such avid readers, and they instilled the love of books in my brothers, sisters, and yours truly. Many are the hours that we spent in the dusty rooms of the old county library choosing books, especially in the sultry summertime. My mother once told me of seeing my Aunt Polly, my father’s sister, feeding her infant twins while reading a book. Hey, why not? It’s so gratifying to see that Carrie is continuing the reading tradition in her home. Her precious baby has no idea of the vistas that the world of words will open for her. Speaking of which, where did I put my copy of The #1 Ladies’ Detective Agency? I must get back to it and find out more about Precious and her life in Botswana. What’s the book I loved at that age? Oh, yes, anything with ‘touchy’ sections on it and “Good Night, Moon”. Hayden, I think Good Night, Moon is still a best seller. There must be something comforting about it that helps children get through the scary dark. My favorite was The Little Engine that Could; in fact, I still like that little book. Barl, I’ve often thought the same thing. Connie, I know what you mean. Once in a while, I’ll let someone borrow a book, and invariably, it’s the very one that I need to look up something in. Not to mention the fact that people don’t always return them! BTW I have a book that I am not sure if you loaned it to me or gave it to me…by Marian Wright Edelman, it has a plaid cover…if you loaned it I have it on a stack to return!